Every once in a while, it is not uncommon to find a raccoon that is gotten itself into a tree. These little nuisance animals are quite mischievous, and will figure out how to get into the oddest places. When you see one there, you may be able to figure out how it actually got up into the tree. There may be a power light, branch, or some other means that the rodent used to be able to gain access into the branches of the tree. However, when you see it there it may make you wonder how you could get a raccoon out of a tree? While it may be cute that the raccoon has gotten itself into the tree, you probably have some concerns about it still being there. 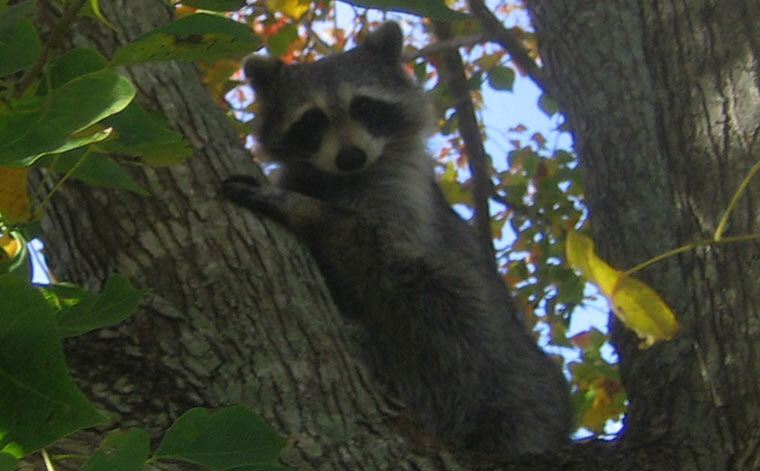 Over time, a raccoon may try to build some kind of nest inside your tree, and may even start to steal fruit or nuts that are growing within the branches of your plant. It sees your treeas the perfect location to gain food, but you see it as another nuisance animal trying to take your food away from you. Now you are looking for a way to get this animal out of your tree branches. Learn here how to identify raccoon tracks. The answer to this question depends primarily upon what kind of actions you are willing to take to get the animal out. What is meant by this is if you have some kind of concern about harming the animal in the process of getting it out of your tree. If your answer to this is no, then there are actually more ways to get it out then you may have thought. Clearly, you probably don't want to kill the raccoon. Not only would this be inhumane, but it may be illegal depending upon the state you live in. The trapping or killing of a raccoon in some states is legal, so let's eliminate that as an option. Find out whether or not raccoons can swim. What may be the very best option at all is to simply use your garden hose with a sprayer attached to it and spray the animal until it gets out of the tree. This may actually not get out of the tree branch and onto the ground, where it is going to impact with a rather loud thud, but you will have gotten rid of the animal out of your tree branches and sent it on its way. This is one of the best options to choose, primarily because it means you don't have to get very close to the animal to be able to scare it away. If you don't want to go to this extreme, you can choose something like a trap to handle your problem. If you put some kind of cage down near the tree with the bait, such as peanut butter or bread, the raccoon will enter into the cage and get trapped. Then you can move the trap to some other location and let the raccoon go so it is no longer in your tree. How much does raccoon removal cost? - get the lowdown on prices. How to get rid of raccoons - my main raccoon removal info guide. Example raccoon trapping photographs - get do-it-yourself ideas. Raccoon job blog - learn from great examples of raccoon jobs I've done. Raccoons in the attic - read about what to do.